Upon conducting more research into the lore of the Wabanaki Confederacy, I stumbled across a very noteworthy legend of an obscure figure shrouded in mystery. This is a being who is a close friend to Gluskabe and the forefather of a line of spies that may have helped shape the future of New England. While lost to obscurity, this pre-contact brotherhood of spies was, in its time, a group to be feared and respected by all, regardless of nationality. They were called “The Red and Blue Men” or “Pogunuk”. The animal they were associated with was the Fisher, a large and dark furred relative of the weasel that is famous even today for it’s ferocity. Without their cunning, it is possible that the Wabanaki Confederacy of tribes that existed in the Maritimes and New England never would have existed. Rather than let their fellow Abenaki tribesman be enslaved or destroyed by enemy tribes, they tricked their enemies into wasting time and resources on fighting each other. Their beaten enemies would either be finished off by the Abenaki’s forces, or be invited to join them in an alliance, which grew. Without this, there may have never been a Wabanaki confederacy and France would have stood alone in the French and Indian wars. Despite this possible historic role, the Red and Blue men slipped into obscurity, as if going into hiding from enemy tribesmen. The most detailed records of Pogunuk as the founder of the Red and Blue men are to be found in the book: Seven Eyes, Seven Legs. 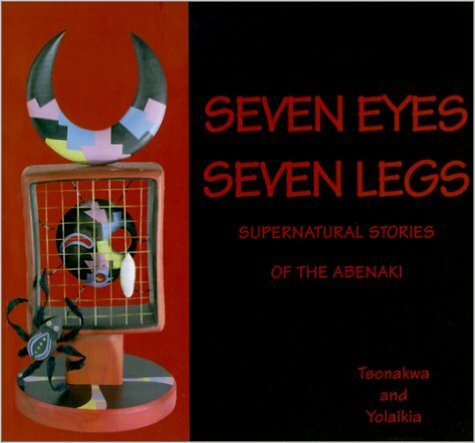 Written by Abenaki couple Mr. Gerald Rancourt Tsonakwa and Mrs. Yolai’kia Wapita’ska, this volume contains Abenaki myths and legends, along with poetry, prose and historical record fragments and photographs of their expertly carved masks, necklace and sculptures. For anyone who wants to see a side to New England that is not usually shown, this book is a must-read. The sculpture made by Tsonakwa and Yolai’kia that shows Pogunuk shows a figure that is enigmatic and striking. The left half of his body is painted bright red and the other half is blue. The division of these colors is lateral, or goes down the midline of the body. He stands in an informal posture with one hand held towards the viewer in an almost welcoming posture. Or was he asking for something to be given to him? It’s up to the viewer to decide for themselves. The origin story of Pogunuk has him as a close friend of Gluskabe to the point where they smoked tobacco together frequently. But Pogunuk did not always own his own pipe. In his mythical origin story, he stole his pipe from an evil wizard after Gluskabe showed him how to defeat him. Whether Gluskabe was indulging in his inner trickster or if this was a punishment for the evil wizard’s deeds is not clarified. The evil wizard had strange powers: he could read minds and could tell when someone was lying. His favorite magic trick was to humiliate and dominate others by turning them into stones and logs for crossing rivers and streams. This last trick was a favorite one of this wizard to play on others. Despite these daunting powers, Gluskabe had a plan. To confound the wizard’s mind reading, he taught Pogunuk to mask his thoughts with ‘decoy thoughts’, so that the wizard could not sense his true purpose as he read his mind. To confound the villagers nearby as well as the wizard, Gluskabe painted half of Pogunuk’s body in red clay and the other half in blue clay. Pogunuk took care to present only his blue half to the wizard as well as the villagers who saw him pass by. Pogunuk masked his plans to steal the pipe with plans of making delicious dried meat. Pogunuk asked for a pot of water to use for making hunting snares with these thoughts in mind and the wizard followed at a distance. The wizard read his thoughts of dried meat made with maple sugar and blueberries and soon grew hungry. The wizard conspired to turn Pogunuk into a blue stone after he was finished making the delicious dried meat. While he waited at the campfire, Pogunuk then went into the Wizard’s wigwam to steal his pipe. Since this is a wizard’s tobacco pipe, it had magical properties of it’s own. It started screaming as soon as Pogunuk picked it up from it’s rack. Despite stuffing it with tobacco to silence it, the wizard already knew he had been tricked. So Pogunuk tricked the villagers when his red side faced them. The Wizard was unable to find the thief and had to go back to his wigwam with anger and humiliation. In other sources, Pogunuk is not a man coated in red and blue clay, but is a fisher. Other names for this animal are ‘fisher cat’, because of it’s similar hunting style and body shape. Because of it’s dark fur and the folk name, it is sometimes confused for a ‘panther’ in the folklore or it is mistaken for a cat. At first, it might be hard to imagine that man painted in bright colors can have any similarity with a dark furred hunter. Perhaps, the blue and red men associated with the fisher and tried to emulate it’s sneaky ways in their own work. It is also worth mentioning that there may be tribal differences here as well. The Abenaki are the tribe who had the Blue and Red men. But in the Passamoquoddy tribe, Pogunuk is a fearsome fisher chief with a fearsome enemy who deserves her own article on Strange New England. It is also important to note that in the mythic age of Native American stories, the line between human and animal is so thin, that it’s hard to tell one from the other. As Tsonakwa and Yolai’kia would say in starting out some stories: “When animals were like men and men were like animals”. In the stories where Pogunuk is an animal shape-shifter, he is a helper to animals and an enemy to another figure, the hideous crone named ‘Jug Woman’, and helps save a sable (another relative of the weasel) from a hungry snake. It is important to note that sable are not native to New England, but come from Russia instead. This story is most likely describing another large weasel like animal, either a pine marten or the now extinct sea mink. Pogunuk heard the sable cry out for help after a hungry and hostile snake found him on his island and ordered him to find a straight stick for use as a spit over the fire for roasting and eating the poor sable. Once he met the hapless creature, Pogunuk hatched a plan. Pogunuk hid behind a fallen hemlock tree while the sable found a crooked stick. When he brought this unsatisfactory spit to the snake, he ordered the sable to straighten it in the fire until it began to shed steam at it’s tip. When the snake watched this happening, Pogunuk took his chance and blinded the snake. Unable to see but able to give chase, the snake pursued the sable. As the snake passed Pogunuk’s hiding place, Pogunuck struck the last blow and slew the snake. To celebrate, he fed his enemy’s cooked body to any other sentient animal who was interested in feasting. In another story, Pogunuk faces his enemy, the Jug Woman. In some versions, he was a chief of the fishers and Jug Woman sought to depose him and take his place as leader. In others, she simply wanted to get back at him for offending her. In some retellings, the Jug Woman could change appearance and gender at will and decided to be a man for a time. Either way, she attempted to maroon him at sea after a failed attempt to shoot down a seabird during a seagull egg gathering trip. Pogunuk tried to fire at the bird and ended up falling into the sea. The Jug Woman then rowed away, singing about how she would take his place. Pogunuk found his way to the island where the Morning Star lived. The Morning Star told Pogunuk to hide in a tree from the vicious beaver who lived there. The beaver killed anyone who arrived on the island when night fell. While Pogunuk was safe for the day, the beaver noticed the newcomer at nightfall and began to chop down the tree with his sharp teeth. He kept calling for the Morning Star’s help, but each time he delayed. ‘Wait until I put on my hat’ or ‘Wait until I open the door’, were common responses. But as soon as the Morning Star opened the door to his wigwam, water on the shore receded and the beaver ran into the ocean and swam away. The Morning Star then instructed Pogunuk to ride atop a horned, snail like sea monster named ‘Wewilliemuck’, back to his home. Unfortunately, he accidentally beaches Wewilliemuck, but carries the monster back to the ocean. As a reward for returning him to the ocean, Wewilliemuck told Pogunuk to scrape some powder from off of his horns. It is a magical powder that he can command to do as he wants. He uses this powder to slay his usurpers and return to his post as the chief. Other darker retellings (where Pogunuk is as vindictive as Jug Woman) have a friendly fox with magical powers who uses the power of faith to swim his friend back to shore despite the magic of Jug Woman using the winds to push them back as they swim. A cruel twist is added to this particular version when Pogunuk gets back to his village: to distract, enrage and move his enemy away from his camp (as well as get revenge), he orders his family to kill Jug Woman’s very young child. This version mentions the fact that Jug Woman had many children, usually with monsters, giants and sorcerers. Like Grendel’s mother, her offspring with such monsters were described as ugly and monstrous like their fathers. Jug Woman pursued Pogunuk and all the while, the villagers mocked her for usurping their leader. Eventually, she ends up in what is now Bar Harbor and wishes with all her might to become something that brings misery forever more to Man. She transformed into the first cloud of mosquitoes. This darker retelling also states that Jug Woman continues to kidnap human children, because they were fair and well-behaved while her offspring are ugly and misbehave. If these abducted children ask Jug Woman why they are different, she will tell them that they were born in the day while their brothers and sisters were born at night. From the darker stories about Pogunuk, we have a character as vicious as his animal namesake. Anyone who knows the fisher knows that this is an animal that is to be respected for it’s ferocity. It is also important to mention that folklore and Disney stories share one commonality: ugly equals evil. While there are exceptions, there isn’t one when Pogunuk’s right to leadership is on the line. It is also important to state that in folklore, a character can be named evil with little reason as to why. Rather than pass judgements on another culture, bear in mind that old folktales came from a simpler time, when the imaginatin was far more likely to play tricks. It is easy to imagine monsters from folklore as not being monstrous when our nights are lit up by electric light. But in a time and place when starlight, moonlight and firelight was all that lit up the old world and the new world, there was no time to be politically correct. Not when there was so much darkness for our fears to thrive on. So little was known about the dangers we faced. Mankind all around the world felt cornered when night fell. Rather than ask the bogeymen we feared if they were misunderstood, we fought first and asked questions later. Being a nocturnal hunter or a nocturnal spy, Pogunuk exemplifies not only the mysterious monsters and magicians we feared, but also exemplified the attitudes towards monsters and evil of a time when red man and white man alike saw the world in simpler, survival oriented terms that post-modern descendants can only imagine. Pogunuk was a friend to Gluskabe and others, but was no friend to enemies. Whether it was a witch that consorted with monsters or enemy tribes plotting to kill for resources, Pogunuk and his Red and Blue descendants used the night and psychological tactics to become as formidable an enemy as the monsters and rivals they faced. I would like to speak to you about the possibility of publishing a book with The History Press but I am unsure of how to get a hold of you.